I would group “cloud” or “platform” based companies like Google, Amazon and Microsoft as a cohort which, although spending significant amounts on capital equipment, do so mainly to support services. Their primary employment of capital is to sustain the infrastructure of data centers necessary to deliver the services underpinning their business models. I would group Intel and Samsung as “component” based companies which use capital to build production capacity that delivers, hopefully, a control point in the value chains they participate in. Note that I am assuming that Samsung Electronics’ CapEx primarily targets semiconductors and displays as it did during the 2006 and 2007 period when data was available. Therefore, given the patterns over the last six years, it might be possible to classify a company’s core business by just looking at its CapEx: The services group showing growth but relatively stable patterns and the components group showing more volatility, macroeconomic sensitivity and an overall higher level of spending, especially as a percent of sales. The question that pops up then is in what category does Apple fall? My observations for over a year have been that Apple is increasing its capital spending to such a degree that it is neither fish nor fowl. It operates data centers but presumably does not operate fabrication plants. And yet it spends more than Intel and Google combined. Contrasting Apple and Samsung Electronics tells an even more interesting story. In the following graph I’ve added two additional items of information: First, although CapEx spending is recorded in the cash flow statement, Apple reported in its yearly (10K) report that it spent an additional $2 billion for equipment which did not pass through cash flow. The second piece of information is that Apple projected its spending for the following fiscal year. I’ve added that spending in a pattern matching the last fiscal year. 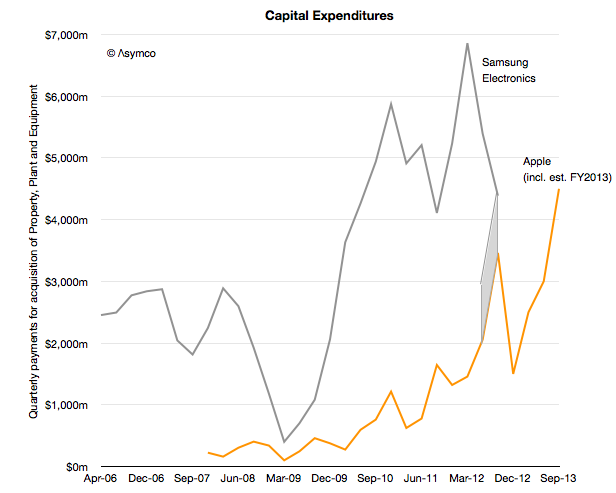 Apple is still spending less than Samsung. 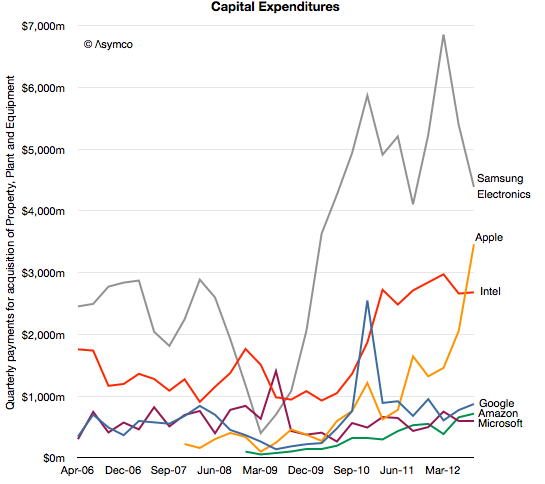 In its fiscal year 2012 Apple spent about $10 billion while during the same time frame Samsung spent nearly $22 billion. However, Apple has begun to bump against Samsung’s spending level on a quarterly basis. For a year we’ve been debating here to what degree Apple has a “capital intensive” business and what exactly could it be spending capital on. One early hypothesis has been that it’s on data centers or on real estate for spaceship campuses. These can be easily dismissed on the knowledge that they can’t cost that much (and that the spending happens gradually). Another hypothesis is that the tooling for milled aluminum cases and other mechanical components is expensive and Apple has to buy a lot of it. But, again, the level of expenditure is in the league of Intel and Samsung which make vast quantities of semiconductors in very expensive plants. It’s hard to imagine milling machines being cost equivalent to chip foundries. The comparison with Samsung, whose vast capital commitments are legendary and are its primary strategic asset puts Apple in a new light. Perhaps we can’t yet call Apple a semiconductor company or even a fabricator but they are putting their “money where their mouth isn’t”. We can infer that it’s not going where the company currently operates. The capital is being deployed almost silently and, though vast in scale, barely gets a mention from analysts. Not even a single question has been raised at any earnings call about this spending. One interpretation is to apply the value chain disruption theory and ask whether Apple is acting to counter a potential disruption. In other words, that this is a specific threat response from an incumbent. There is some logic to this because the antagonism between Samsung and Apple is so strong that it might justify a reaction of this kind. However, I believe that there is a more measured process at work over a long period of time. The one distinguishing advantage and attribute that Apple has is its preference for integration. This preference is not a secret and Tim Cook repeats it often. The integration is evident with their move into retail and component design, in other words in both directions along a value chain. So my hypothesis is that this is part and parcel of an ongoing re-alignment of their role in the value chain. This second explanation suggests that Apple simply wants to control all the areas which affect the value they produce. First because they feel that there are areas that are not good enough and the product/experience cannot be good enough if its constituent parts are not good enough. Second because without control there are constraints to what it can do strategically. Whatever the reason, I read the evidence of increasing commitment and engagement in parts of the value chain as part of a continuous evolution of Apple’s role. Furthermore, it’s something that should be seen as a signal of a new era in how technology companies operate. We see hints of “vertical integration” with Microsoft building hardware, and Google buying Motorola and Amazon selling devices. Apple did all these things and now it casts an eye over the next frontier: components.